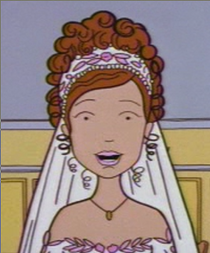 Erin Chamber is Daria's cousin and the daughter of Rita Barksdale, introduced in "I Don't". She was twenty-one when the episode took place and lived somewhere that sounds vaguely Deep South, and had a salaried job. When accused of being unwilling to work for her money, Rita told Helen she had to focus on raising Erin - even when she was 24 and herself employed at the time. Erin was introduced as a bubbly, simple-and-happy woman looking forward to marrying her obnoxious husband Brian Danielson - easily shrugging off his sexist comments - with implication that she was rushing into it. Helen muttered darkly about how Grandma Barksdale was willing to spend money on "favourite daughter's darling offspring" (she was footing the wedding) and never her other granddaughters, while wanting to believe Erin hadn't had the unspecified & vague "advantages" that her daughters had. In her one scene with Daria, Erin seemed happy to see her and boasted that Brian had a job in US intelligence. Two years later, in "The Story of D", Helen learned that Erin hadn't actually loved Brian and only married him because after he gave her herpes, she felt nobody else would love her. 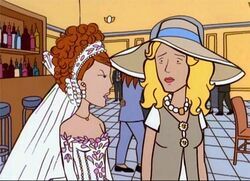 (This immediately terrified Helen into checking on Daria and Tom Sloane) In "Aunt Nauseum", Rita mentioned that the government fired him after the honeymoon and "they've been living off her salary while that clown tries to pass his real estate exam", and Erin revealed over the phone that she and Brian had signed a 50-50 asset split prenuptial that put her at a disadvantage. "It Takes Two to Tangle", put out partway through Season 5, snarked "It's nice to see young people returning to tradition…like the tradition of the ill-conceived first marriage." By "Aunt Nauseum", an unseen Erin had separated from Brian and Grandma Barksdale pressured Helen (who wasn't a divorce lawyer) into handling the divorce case. Erin was meant to come to Lawndale to go over the case but Grandma Barksdale abruptly set Erin to a Swiss spa instead. Brian flew out to meet her and the divorce was called off for a second honeymoon, and we're all sure that it worked out fine. While Erin was friendly to Daria (and Quinn friendly to Erin), Daria avoided her and in "Nauseum" (as well as snarking about using boiling oil on her cousin), she stated, "I couldn't care less about Erin." Ouch. Fandom has often assumed that Grandma Barksdale arranged for Brian to be flown out and the couple to have a second honeymoon. Both "The Story of D" and "Aunt Nauseum" were written by Jacquelyn Reingold, allowing her to link the two episodes. This page was last edited on 1 April 2018, at 13:24.